November is Here and We are Feeling Thankful! We are Giving You FREE* Seed! 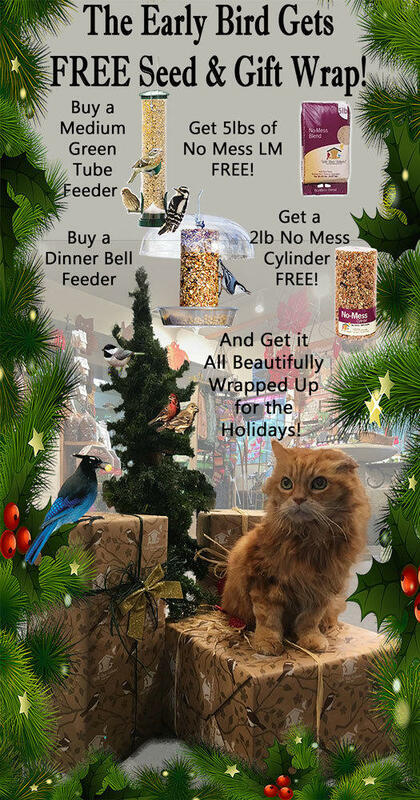 Buy a Medium Supreme Green Tube Feeder and get a 5lb bag of our awesome No Mess LM seed FREE* Or buy a versatile Eco-Clean Dinner Bell Feeder and get a FREE* 2lb No Mess Cylinder! WBU Tube Feeders and Dinner Bells are all Lifetime Guaranteed, Easy to Clean & Made in the USA! And as an added bonus for you early birds we will have these deals pre-wrapped and ready for your holiday nature gift giving needs! *One 5lb bag of No Mess LM per Medium Green Tube Feeder only. *One 2lb No Mess Seed Cylinder per Eco-Clean Dinner Bell Feeder only. Prewrap available while supplies last. Sale ends 11/18/18.